students, staff and the community. I manage and maintain the Wolfe University Center computer lab and Web site. I also order technology and offer technical support for the Wolfe University Center. Number of years at FIU: Six-and-a-half years. From July 2003-April 2007 I was a Student Government Officer and I’ve been a WUC staff member since May 2007. There are two things: The first is working with the students and getting the chance to see them succeed in what they set out to accomplish. The second is marketing off campus by attending networking events and meeting members of our community. That we offer a program called the Team Ropes Adventure Challenge to both groups on and off campus to strengthen their team building skills. We also host Web sites for many areas of Student Affairs at the Biscayne Bay Campus. What I call my secret space, which is a very tranquil seating area behind Academic II. I like it because it is quiet and no one seems to know about it. How amazing and majestic the Biscayne Bay Campus is and that we are Miami’s university. I have an amazing family that is extremely loving and supporting. I live with my parents, Marci and Harvey Trautenberg. I have one younger brother earning a bachelors degree in Orlando at the University of Central Florida. I have three dogs, Bowser, Odie and Lola. I also have two cats, Elvis and Boo Boo. First paying job: A summer internship at my high school, Dr. Michael M. Krop Senior High. In 2001, about a year after I had major back surgery, I was granted a wish by the Make-A-Wish Foundation. I asked to ring the bell at the New York Stock Exchange. Being the youngest person to ring the closing bell is up there on my list. I love designing Web sites, photography, animals and spending time with loved ones. I truly enjoy supporting the community. I like mentoring students and advising organizations that benefit others. I try and volunteer whenever possible. I am also working on a master’s in nonprofit management from the University of Central Florida. You rock Zach! BBC would not be the same without YOU! Thanks for always being such an advocate for our IT Security team! 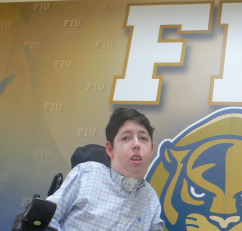 Zack exemplifies the fact that persons with disabilities can and often are very successful and committed individuals. Zach is a role model for all persons with and without disabilities. He has repeatedly proven that what is important in life is our abilities not our disabilities. I consider myself lucky know and be a friend of Zack.